Auto roulette is a variant of European roulette that is suited to those high rollers looking for fast-paced action at the wheel. Auto Roulette from Evolution Gaming is capable of producing up to 80 games every hour – so you can see things are certainly fast and furious. There are no table opening hours as this game is available 24 hours a day, 7 days a week. Evolution Gaming are the creators of Auto Roulette and have designed it to look more virtual than real-life – with the screen focusing on the betting table with a small real roulette wheel to the top left of your screen. The difference with this live dealer casino game is the fact that there is no dealer. Auto Roulette is not created to be a sociable game – it’s there for high rollers who want to play their games as fast as possible. This game is a VIP game suited to all stakes, but VIP’s can place big bets of up to 20,000 a time. Surprisingly, the minimum chip bet is just 0.20 which we weren’t expecting from a high roller roulette game. 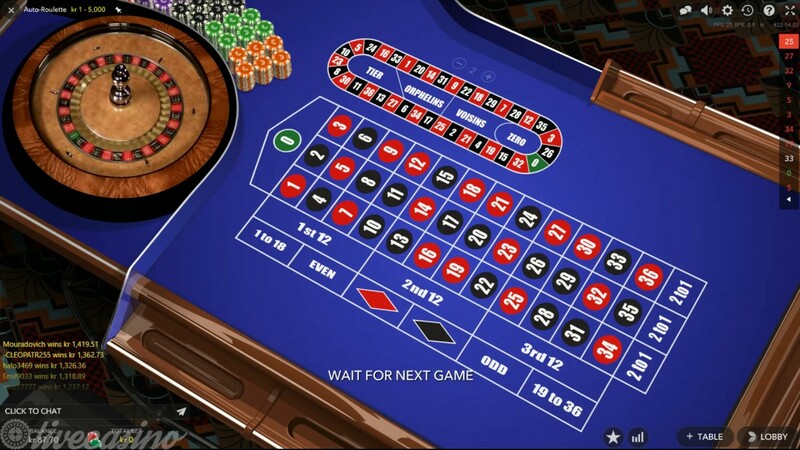 Auto Roulette games plays to standard European roulette rules and features 37 pockets and a single zero. If you’ve played roulette before you will know that there are numbers 1 to 36 on a European table. The usual bets you can expect can be found too, with the biggest payout being with the straight up bet which is 35 to 1. When it comes to placing your bets, the chip denominations are placed to the lower of your screen. Drago those chips and drop them where you’d like to place your bet and watch the wheel automatically shoot a ball onto the wheel to produce a winning outcome. Players can view the table and wheel from multiple angles. Auto Roulette has many similarities to other online roulette games, but the big difference is the ability to place mega stakes. Your screen will house a display where the recent numbers of the wheel can be found – to help you make your next bet decision. The game may look virtual, but the roulette wheel is real. There’s a house edge of 2.70% with Auto Roulette. The fast-paced action of this game won’t suit everyone, but we love how you can play as many as 80 games per hour. Standard European roulette games have you waiting several minutes between games – you won’t find that here. The stakes are raised, so no more table limits in place to keep you at a certain betting level. This is a 24/7 roulette game that is ready when you want to play and offers a luxury VIP feel to it. You don’t have to sit and listen to live dealers making idle chit-chat either as this live dealer game features no dealer – it’s a win win situation. You can play Auto Roulette at Evolution Gaming casinos, such as; Betsafe Casino, 32Red Casino and Genting Casino. Residents of the US are not eligible to play this game. Desktop, laptop, mobile and tablet users can access the thrilling fast game of Auto Roulette and there are no downloads required either. Launch the game and it will load instantly thanks to flash and HTML5 technology.